We’re gearing up for our first Cars and Coffee of the season! This is the place to be to get your monthly fill of caffeine and octane! Bring a friend along with you, or someone who has never been to one of our events before. We hope to see everyone there! Friday – Afternoon: valve cover races; Evening: cruze-in at a local site. They will have food to purchase. Saturday – Morning: concours and car display judging; After lunch: autocross, funkhanna racing and model car display; Evening: the awards banquet with plenty of good food. 18 trophies will be awarded. For all Registered Recall attendees – Recall will include our hospitality room with munchies available all the time and a lunch Saturday at noon. Lunch will have sandwiches, chips, cold vegetables, and fruits and lots of great desserts. 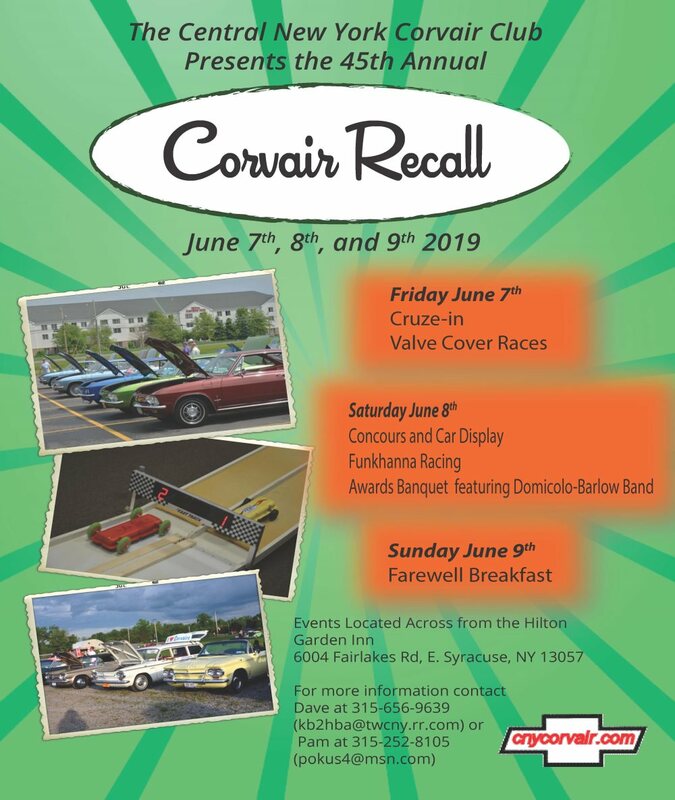 CNYCC would like to take this time to invite all Corvair owners and lovers to our 45th Recall on June 7 – 9, 2019 at the Hilton Garden Inn, 6004 Fair Lakes Rd, East Syracuse NY 13057. Our first Recall was in 1974 and this year we celebrate our 45th and would love to see all of you there to help make it a special celebration of our hobby that brought us so many new friends over the years. The hotel has reserved a block of rooms for us and you can call them at 315-431-4800. Be sure to mention you’re with the Corvair club to get a discount rate of $103 per night. Friday afternoon will start with the valve cover races and in the evening we’ll caravan over to a local cruze-in for an enjoyable time. They have a terrific food truck available to purchase your evening meal from and a near by ice cream stand to top that off. Our hospitality room opens at noon on Friday for munchies, Saturday morning at 8:00 with coffee and lots of donuts, breads and goodies. Grab a bite before going to the Saturday morning Concours and Car display. Judging will be until noon. And for all registered Recall attendees we’ll have our famous Saturday buffet lunch at 11:00 that includes an unequaled variety of sandwiches, chips, salads, veggie trays, fruit bowls and lots of great desserts. This will leave you plenty of time to enjoy lunch before the afternoon activities start. Door prizes will also be given out during the Saturday lunch. Come prepared for a technical drive for now it’s time for the Autocross and Funkhana to finish the afternoon off. The model car display will also be this afternoon. Saturday evening brings us to our awards banquet with a buffet loaded with goodies. Come and find out who will take home one of our 18 trophies. And who’s car will be featured on our program cover, dash plaques and Saturday evening cake? Come and find out. You could be next! As an alternative to any activities you may wish to visit Syracuse’s huge Destiny Shopping Mall or a truly unique visit to the Erie Canal Museum on Erie Blvd. We hope by displaying this notice early that you can save this date and join us for a fun weekend. If you have any questions or need help please call Dave at 315-656-9639 or Pam at 315-252-8105. 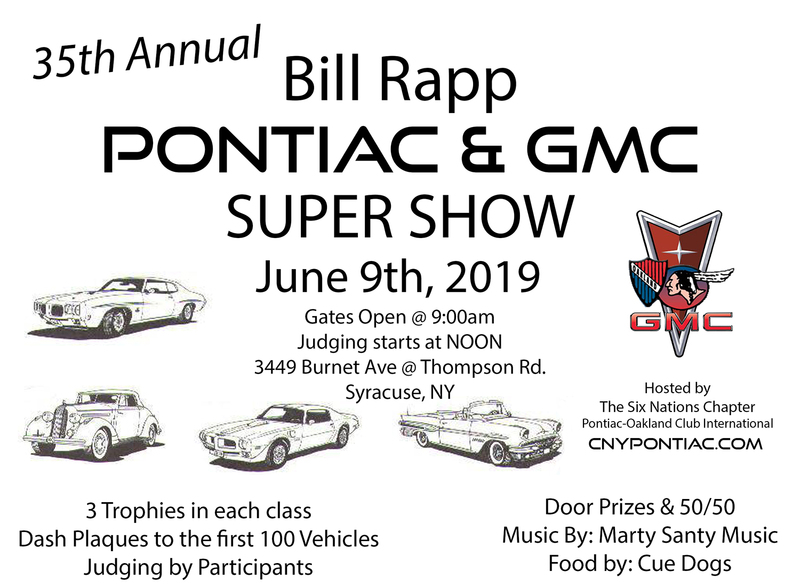 The 2019 event, which marks the 20th Anniversary of the Syracuse Nationals, will be held July 19, 20 and 21, at the New York State Fairgrounds.